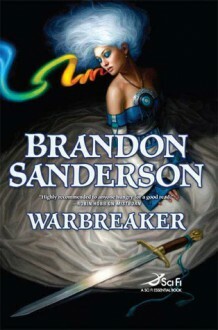 After bursting onto the fantasy scene with his acclaimed debut novel, Elantris, and following up with his blockbuster Mistborn trilogy, Brandon Sanderson proves again that he is today’s leading master of what Tolkien called “secondary creation,” the invention of whole worlds, complete with magics and myths all their own.Warbreaker is the story of two sisters, who happen to be princesses, the God King one of them has to marry, the lesser god who doesn’t like his job, and the immortal who’s still trying to undo the mistakes he made hundreds of years ago.Their world is one in which those who die in glory return as gods to live confined to a pantheon in Hallandren’s capital city and where a power known as BioChromatic magic is based on an essence known as breath that can only be collected one unit at a time from individual people.By using breath and drawing upon the color in everyday objects, all manner of miracles and mischief can be accomplished. It will take considerable quantities of each to resolve all the challenges facing Vivenna and Siri, princesses of Idris; Susebron the God King; Lightsong, reluctant god of bravery, and mysterious Vasher, the Warbreaker. An interesting listen and a book that held up very well throughout most of the story. I was not really enamored with the finish which the author was apparently undecided in whether this was the whole story or that there were going to be a series with further books. Recommended for Sanderson fans. http://faceofbook.booklikes.com Face of Book 4.5 To w końcu siał, czy zapobiegał? text To w końcu siał, czy zapobiegał?